The as I mentioned on Wednesday the weather is changing. It's getting warmer now that March is here. Which means people will ditch their treadmills for a more natural walk, jog, or run. On a side note, do people still jog? Anyway, back in the early 80's Converse was all about the running and jogging. I am not mistaken, this shoe was one of the first tome come from the Converse Bio Lab in early 80's. Yes I am talking about the funky Converse Odessa. I only have one pic, but it shows you all you need to see. Funky side lace system. 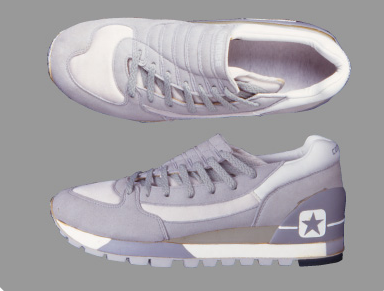 But the main reason I love this shoe is the use of the Star in Square logo. If you've been reading for a while, it is my all time favorite Converse logo. And this is one of the only shoes I've ever seen where this logo was the primary logo. I don't know much else about the shoe, but I do know that this needs to be re-issued, soon. I really think it would be a nice addition to the Converse Century collection. Only time will tell though, but I sure hope to see them again someday. Before I go I want to give some love to BounceMag.com, last night they ran an interview I did with Jeremy Ripley. Big thanks you Jeremy for not only contacting me about this opportunity but for posting Converse stuff on BounceMag.com. Well, I am out for the weekend. Oh, I almost forgot, I want to take the time to thank all of the good Wildcat fans from Catspause that have stopped by to vote for UK in the poll. Please take a few minutes and read through some stuff, I hope you like it. Thanks for stopping by the Converse Blog! The Converse Blog's Friday Flashback: Roll Out!